Slack is one of the best workspace collaboration platforms out there, but it still lacked one major functionality which seems like a gross oversight. And Slack is now changing that with Actions, which allows users to convert a message shared on Slack into a task. Until now, you couldn’t simply assign messages to work tasks in Slack-compatible apps, and needed slash commands to send messages to third-party apps. With Actions, messages can be assigned to tasks in apps such as Hubspot, Zendesk, Asana and Jira with just a click. Announced at Spec, Slack’s first developer conference, Actions is aimed at further strengthening the integration with third-party tools, and makes Slack messages more useful. All one has to do is just click on the context menu in the right-hand corner of a message and tap on the Actions button to send data from Slack to other apps without leaving Slack. Aside from creating a task, users can also add relevant contextual information to the task they have created on the third-party apps. For example, if you are using Asana, you can turn a Slack message into an Asana task, complete with details like the person responsible for finishing it, a due date, corresponding projects and more. Moreover, users will also be able to attach Slack comments to their Asana task for additional contextual information. Similarly, users will be able to create a ticket and add a Slack comment to it in Zendesk, add a Slack remark to a pull request in BitBucket and create a task in Hubspot. 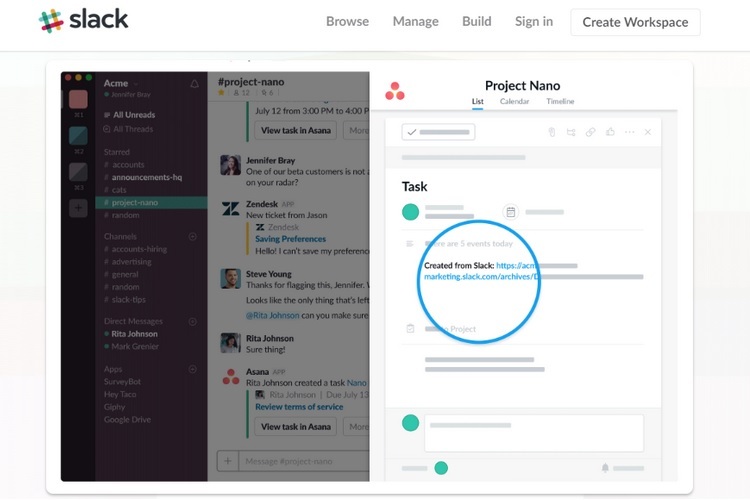 Moreover, Slack’s Actions are also supported by other apps such as Pocket, Teamline, To-Do, and Guru. Aside from Actions, Slack also plans to release a new Block Kit for developers that will allow them to design ‘rich integration experiences that feel native and intuitive to conversations in Slack’. The new UI toolkit will come with standard designs for elements such as date pickers, task objects and overflow menus to name a few.